On January 1, 2017, the NREMT implemented the new scenario based psychomotor exam. Paramedic candidates are tested on (6) skills, including an integrated out-of-hospital (IOOH) scenario. The scenario will reflect either a pediatric, geriatric or adult patient. Each candidate will be provided with a trained paramedic partner and evaluated on his/her ability to manage a call, lead the team, effectively communicate, and maintain professionalism throughout the simulated patient encounter. NREMT & NAEMSE are partnering to bring a brand new educational opportunity entitled Regional Scenario Development Workshop. This is a registration free workshop designed to provide you with hands-on experience developing formative and summative scenarios for use in your classroom. Workshops are limited to 50 participants who will be guided through the scenario development process by NREMT staff. Topics that will be covered are scenario writing, calibration, and evaluation in the workshop. Scenarios created in the workshop will be available for use following the event. In 2017, the National Registry of EMTs (NREMT) changed the way it verifies psychomotor competency for National Registry Paramedic (NRP) Certification. Several factors prompted the NREMT to change its psychomotor examination. The first was a desire to ensure protection of the public by assessing psychomotor competency in a way that simulates actual practice in a simulated environment. The second factor is that EMS employers often find that while newly certified paramedics know how to perform individual skills, they cannot move to the next level and integrate those skills into scene and patient management. Finally, the NREMT now requires that all paramedic candidates graduate from a CAAHEP-approved paramedic program or one that holds a current Letter of Review (LoR) from the Committee on Accreditation of Educational Programs for the Emergency Medical Services Professions (CoAEMSP). Scenario examinations allow the NREMT to incorporate essential attributes of Team Leadership along with scene and patient management, thus better reflecting actual out-of-hospital care as opposed to continuing to test 12 isolated skills. The NREMT developed a portfolio of vital skills that each paramedic student must master to qualify for the NRP Certification examination. The program tracks each student's portfolio throughout the formative and summative phases of education in the laboratory, clinical, and field internship settings. The completed portfolio provides a mass of evidence that documents a candidate’s acquisition of psychomotor competency in the skills we currently evaluate on the 12-skill NRP Psychomotor Examination. All students that begin their paramedic program on or after August 1, 2016 are required to complete a portfolio that becomes a part of their permanent educational file and is a prerequisite to seeking NRP Certification. 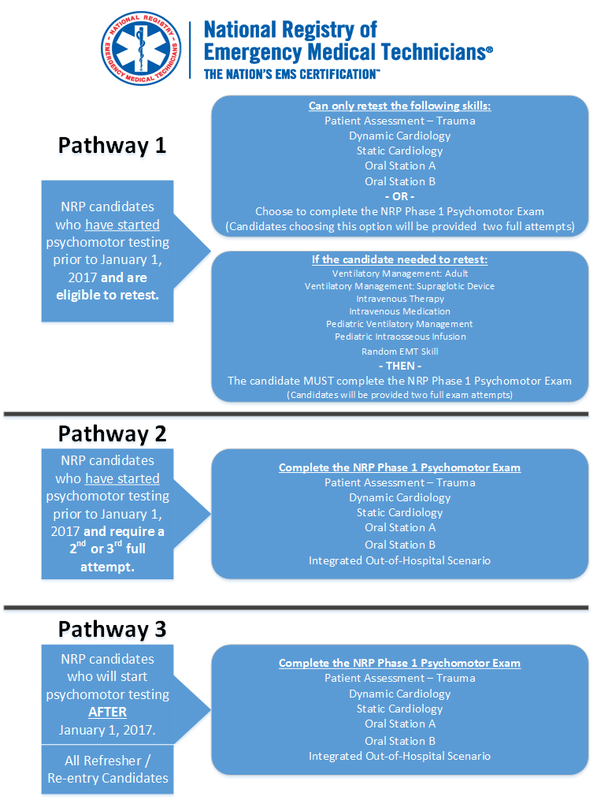 Starting on January 1, 2017, Paramedic candidates had three potential pathways to satisfy the psychomotor examination. What is the Integrated Out of Hospital Scenario? Beginning January 1, 2017, the NREMT will implement the new scenario-based psychomotor exam. In the new test model, Paramedic candidates will be tested on a total of six skills. Five skills from the traditional NRP Psychomotor Examination (Patient Assessment – Trauma, Dynamic Cardiology, Static Cardiology, Oral Station Case A, Oral Station Case B) will be tested, with the addition of an Integrated Out-Of-Hospital Scenario. You will be evaluated on your ability to manage a cardiac arrest situation, including actual delivery of electrical therapy and "voicing" all interpretations and treatments given a scenario. The presentation of the portion will be similar to a "megacode." Given four (4) prepared ECG tracings with associated patient information, you must verbalize the interpretation of each rhythm and voice all associated treatments. The Integrated Out-Of-Hospital Scenario (IOOH) will reflect either a pediatric, geriatric or adult patient. The candidate will be provided with a professional paramedic partner and evaluated on their ability to manage a call, lead a team, effectively communicate, and maintain professionalism throughout the simulated patient encounter. Download all the Paramedic Portfolio Forms in a single binder . These sample IOOH scenarios were created by Regional Scenario Development Workshop (RSDW) attendees in 2016 for the purpose of giving paramedic education programs a strawman resource to prepare for IOOH scenario based ALS exams. Many of the attendees who created them are paramedic educators/program directors from across the U.S. They were not created by NREMT. NREMT gives permission for these samples to be tweaked and utilized in EMS education programs for formative and summative assessments. Select a scenario type and a patient type to view a list of matching scenarios. There are no scenarios that match these criteria.